Yum, yum, yum… fresh baked crafted goodness! 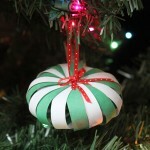 The idea for these little pies popped into our elfy heads while making the Linzer sable ornaments. One of our favorite details is the jam oozing out of the sides of these pies. Make ‘em for yourself or for anyone who loves to bake—no kitchen required! 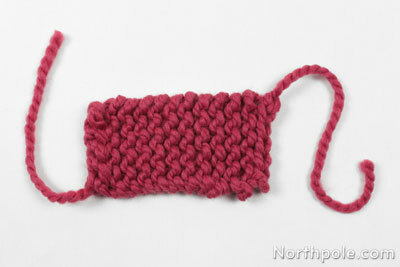 Knit or crochet a small rectangle about 3" x 5". 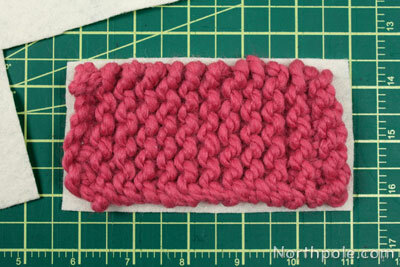 Our knitted rectangle was about 25 rows of 6 stitches each. We used Lion Brand Wool Ease Thick & Quick yarn. 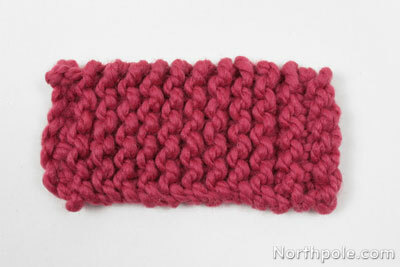 This yarn is great because it doesn’t take long to knit a little, bitty rectangle for this project. 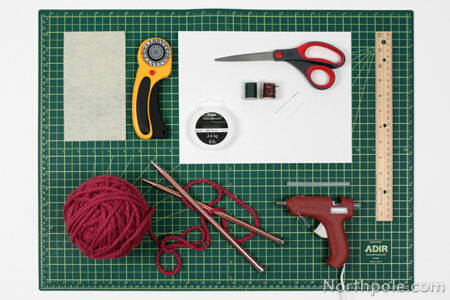 Note: To learn the basics of knitting, here are some good vidos to learn how to cast on, knit rows, and cast off. 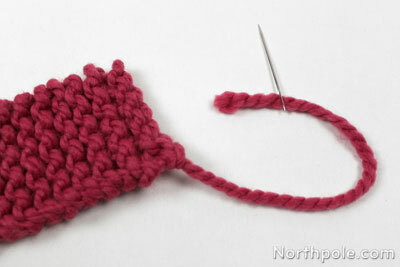 After you’ve knitted your shape, cut the yarn. Set skein and knitting needles aside. 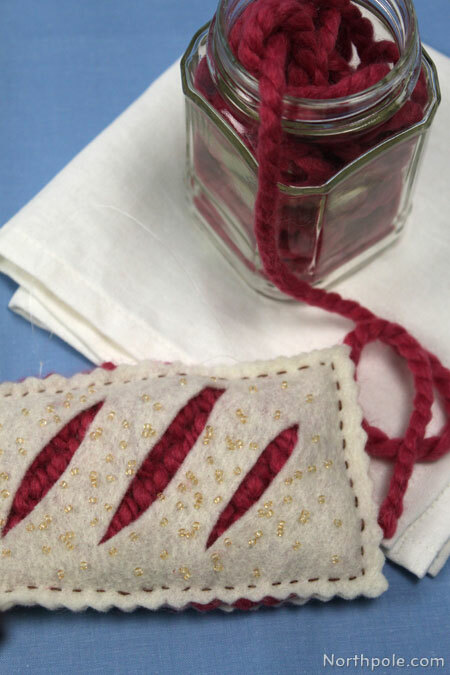 Using a hook or large-eyed needle, weave the ends of the yarn into the shape. Trim ends of yarn and set hook/needle aside. 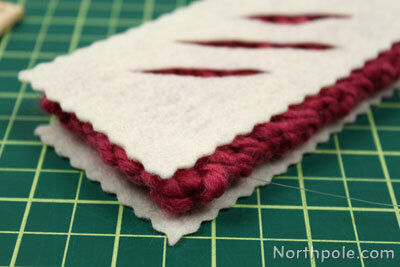 Place the knit rectangle onto felt and cut a 2 rectangles just slightly bigger than the knit. Set the knit rectangle aside. 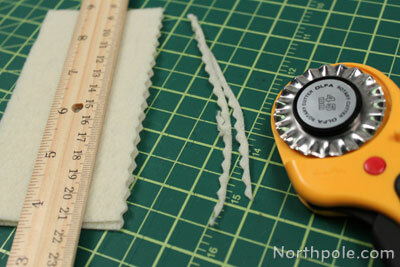 Stack the two felt rectangles together, and then trim the edges with the pinking blade/rotary cutter. 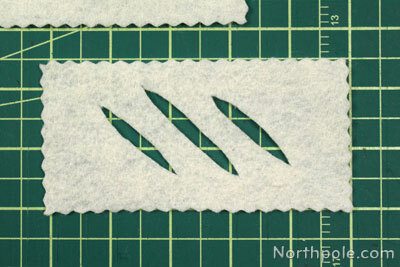 Take one of the rectangles and cut 3 slits for steam to escape from the pie while it’s "baking"
On the solid felt piece, glue a strand of clear string to make the ornament hanger. 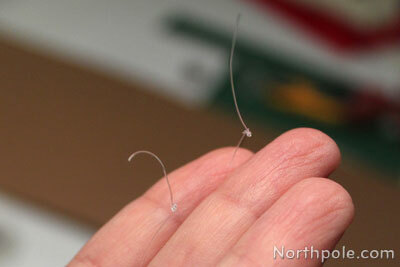 Cut a string that is 8" long. Tie each end in a double knot. 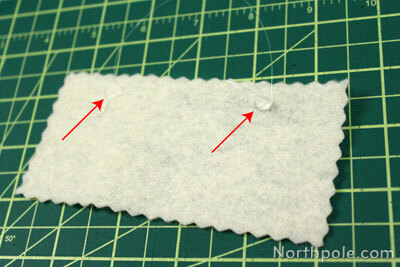 Glue each end to the felt, about 0.5" from the edge and spaced 2" apart. 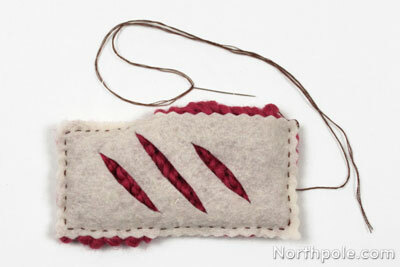 Now stack the rectangles together in this order: solid felt, knit, felt with slits. 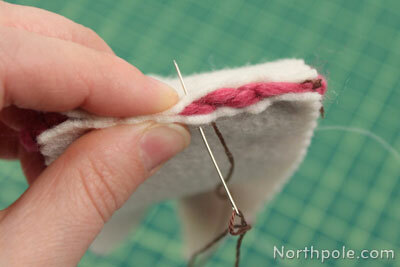 Begin sewing around the pastry, allowing the “jam” to spill out of the edges occasionally. Continue sewing around the pastry. 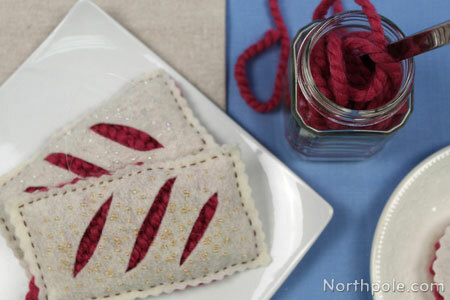 If the jam becomes too big for the pastry while you are sewing, don’t fret! 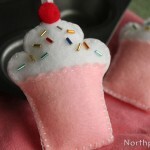 It is okay; just push the jam in the pastry as you continue sewing. You can have as little (or as much) of the jam showing as you like. Now your jam pie is finished. Yum! Add beads to look like demerara sugar. We used translucent 11/0 seed beads; they can be found at your local craft store or online. We used clear beads on one pie and light amber beads on the other pie.